Sudoku is one of the most popular pen-and-paper puzzles in the world. It’s found in numerous daily newspapers, puzzle books, and smartphone apps. After years of tackling regular Sudoku, Extreme Sudoku, Word Sudoku, Mega Sudoku, Samurai Sudoku, Geometric Sudoku, Sum-Doku, and numerous other variations, you’d think the puzzle community at large would’ve exhausted every possible version of Sudoku. Enter the crafty folks at ThinkFun, who have put a unique spin on another Sudoku variant: Color Sudoku. In Color Sudoku, you have nine colors to arrange instead of numbers. 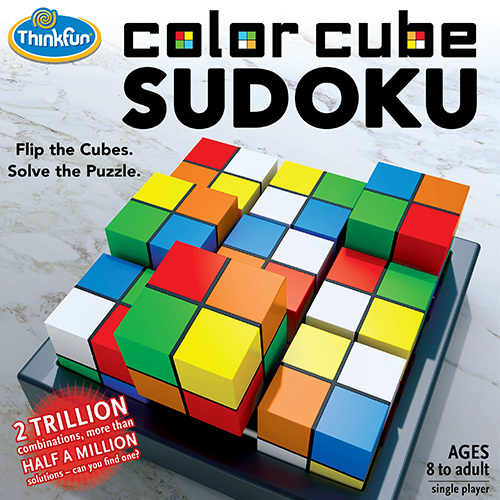 ThinkFun has upped the ante with Color Cube Sudoku, their latest puzzle-game, by combining the twisty-turny cube possibilities of a Rubik’s Cube with Sudoku-style deductive solving. It seems like a simple enough set-up. You’ve got a tray and nine multi-colored cubes. 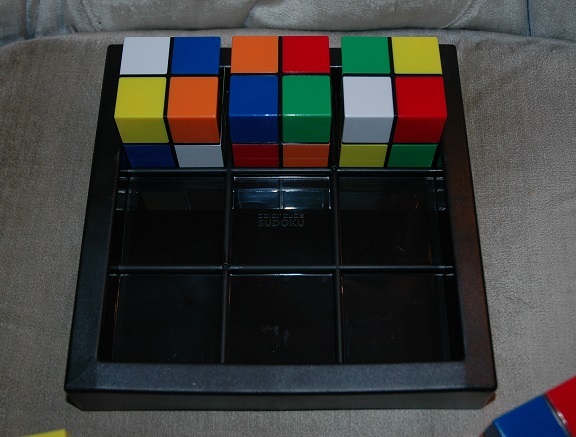 Each cube has four of the six possible colors: green, red, blue, yellow, orange, and white. And it’s up to you to arrange the nine cubes in the grid in a 3×3 pattern so that each color only appears once in each row and column. But that arrangement already introduces complications. 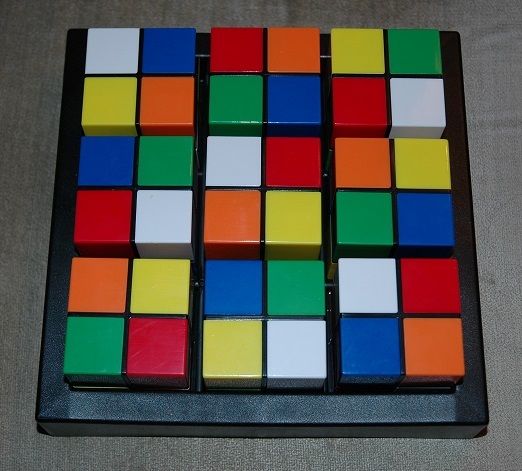 Unlike a pen-and-paper puzzle, where you can place any number (or in this case, any color) in any square you choose, the preset color arrangements on each cube limit your choices. If you need a blue square in the first row, sixth column, given the cubes available to you, you might end up with a second yellow square in your row. 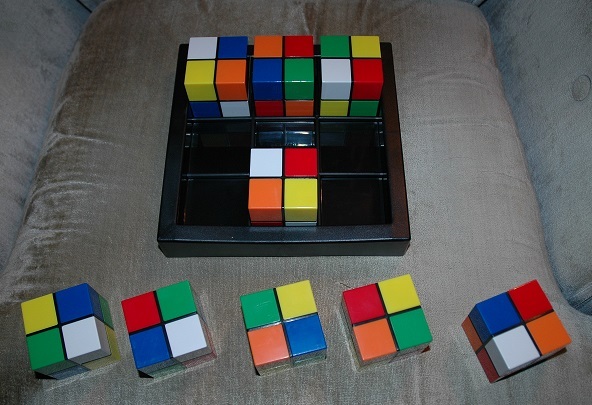 Which means, instead of needing a new cube, you need to change one of the cubes you’ve already placed and try again. What once seemed simple now offers a greater challenge. But, like many ThinkFun puzzle-games, the more you play around with the possibilities, the more you begin developing new strategies and get into the psychology of the puzzle itself. Once you’ve placed a few of the cubes, next-level deductive reasoning kicks in, and you can eliminate certain possibilities and begin working more than one step ahead at a time. For instance, if you’ve placed two cubes in a column, you’ll know you need to change one of the cubes if the third cube will need a green spot in both columns. Since that’s impossible, even without placing the third cube, you know you need to change one of the two you’ve already placed. Which means you’re preventing wasted moves and pushing closer to an actual solution. Whether you’re tackling Color Cube Sudoku alone or with partners, whether you’re trying to crack a regular 6×6 pattern or taking a whack at some of the variant challenges they suggest — like knight’s paths and other difficult patterns — this is a deduction puzzle that feels like play instead of work. When I tested this out with a fellow puzzler, we immediately began playing it in a slightly more competitive way. One of us would place a cube, and then the other would place a cube, and we would keep going until no cube could be placed. You can end the game there, or you can take it a step further, and introduce rules where moving or shifting previously-placed cubes becomes part of the game in order to extend the puzzly gameplay. Heck, if you go long enough, it eventually becomes a race to see who can actually solve the Color Cube Sudoku layout first! The designers state that there are 2,641,807,540,224 different ways to arrange the 9 cubes, and with seemingly endless variation in such a simple set-up, this is one puzzle-game you can put down and return to numerous times without burning out or feeling like you’ve conquered it forever. Color Cube Sudoku is available for $19.99 from ThinkFun and select retailers! This entry was posted in Games, PuzzleNation, Puzzles and tagged Color Cube Sudoku, color sudoku, extreme sudoku, games, Geeking Out, geometric sudoku, mega sudoku, Pop culture, product review, PuzzleNation, Puzzlin' fool, Rubik, rubik's cube, samurai sudoku, Sudoku, sum-doku, ThinkFun, word sudoku by gmdirect. Bookmark the permalink.